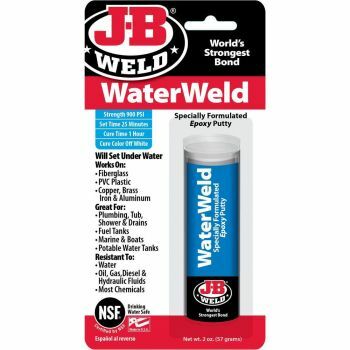 J-B Weld 8277 WaterWeld Epoxy Putty Stick - 2 oz. Hand-mixable epoxy putty stick specifically formulated to plug or seal leaks and patch holes and cracks in almost anything. -Great for repairing plumbing, fuel tanks, tubs, showers, drains, boats and portable water tanks. -Sets in 25 minutes, cures in 1 hour to an off-white color with a tensile strength of 900 PSI. -Once cured it forms a permanent bond and can be drilled, tapped, filed, sanded, painted and will withstand temperatures of up to 300ºF. -Works on moist surfaces and under water.